Definition: Sweating is a bodily function that helps regulate our body temperature. The sweat is a transparent colorless acidic fluid with a peculiar odor. It contains some fatty acids and mineral matter. It is also called perspiration. Sweating in normal amounts is an essential bodily process. In humans, sweating is primarily a means of thermoregulation, which is achieved by the water-rich secretion of the eccrine glands. Maximum sweat rates of an adult can be up to 2–4 liters per hour or 10–14 liters per day (10–15 g/min·m2), but is less in children prior to puberty. Sweating is how our bodies keep cool. We have sweat glands in the skin over most parts of our body. They are in the layer of the skin called the dermis. The nerve cells in the dermis control sweating. Causes, Signs, and Symptoms of Sweating: Diaphoresis is a non-specific symptom or sign, which means that it has many possible causes. Some causes of diaphoresis include physical exertion, menopause, fever, ingestion of toxins or irritants, and high environmental temperature. Strong emotions (anger, fear, anxiety) and recall of past trauma can also trigger sweating. Sweating may be a response to the foods we eat as well. This type of perspiration is called gustatory sweating. The hormonal fluctuations associated with menopause can also trigger sweating. Menopausal women often experience night sweats and sweating during hot flashes. Sweat is not pure water; it always contains a small amount (0.2–1%) of solute. The volume of water lost in sweat daily is highly variable, ranging from 100 to 8,000 mL/day. The solute loss can be as much as 350 mmol/d (or 90 mmol/d acclimatized) of sodium under the most extreme conditions. During average intensity exercise, sweat losses can average up to 2 liters of water/hour. In a cool climate and in the absence of exercise, sodium loss can be very low (less than 5 mmol/d). Sodium concentration in sweat is 30-65 mmol/l, depending on the degree of acclimatization. If heavy sweating has no underlying medical cause, it’s called primary hyperhidrosis. If the sweating can be attributed to an underlying medical condition, it’s called secondary hyperhidrosis. Infection is one of the most common causes of sweating in people who have cancer. Infection can give you a high temperature and your body sweats to try and reduce it. Treating the infection can control or stop the sweating. 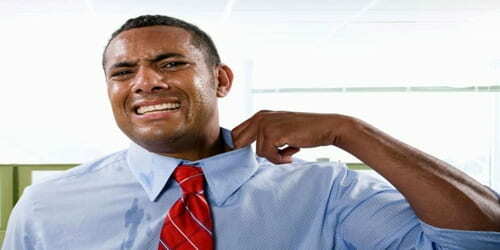 People have an average of two to four million sweat glands. 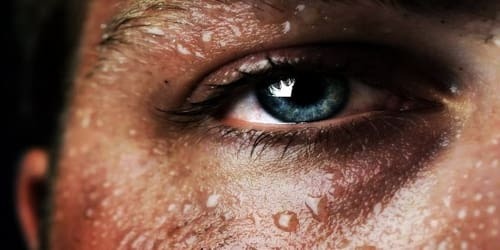 But how much sweat is released by each gland is determined by many factors, including gender, genetics, environmental conditions, age or fitness level. Two of the major contributors to sweat rate are an individual’s fitness level and weight. Losing weight from excessive sweating isn’t normal and should also be checked by a doctor. In humans, sweat is hypoosmotic relative to plasma (i.e. less concentrated). Sweat is found at moderately acidic to neutral pH levels, typically between 4.5 and 7.0.